Do The Pastels really need a long introduction? Of course not! Inventors of Glasgow indie-pop, they were around even before The Jesus And Mary Chain. Only singer and guitarist Stephen Pastel and Aggi on bass and vocals remain of the original lineup. Current drummer Katrina Mitchell joined in the early 90s, while notable ex-members include Teenage Fanclub frontman Norman Blake. Despite their legendary status, they never were *that* successful, neither when the first Scottish indie waves crashed down over London in the late 80s with the Vaselines or Teenage Fanclub, nor in the mid-90s, when Bis were one very cover in England and The Delgados got rave reviews. Since their ultra-hard-to-find debut single on Creation Records ages ago, they have been dropped by or left many labels. Their imminent sixth album, "Illumination" sounds different from their previous records. The band has been influenced by free jazz a lot lately and that means that the shiny indie pop elements are pushed back a little bit. Nevertheless, the records sounds pretty amazing. It will be released on Domino (in Europe), preceded by a single ,Unfair Kind Of Fame", that also includes a My Bloody Valentine Remix of another album track, ,Cycle" Thanks to Dirk @ Rough Trade Germany, we had The chance to meet The Pastels before they hit the stage in Cologne for the last of a short, four-date German tour supporting Yo La Tengo. They were supposed to arrive at the venue at 4 p.m., but due to heavy traffic and the bands late departure from Munich they only arrived at 7.30 p.m., half an hour before they were due to be on stage! Despite all the surrounding chaos, after a soundcheck and a quick dinner we sat down with Stephen for half an hour to ask him a few questions. Even though he was a bit shy and distant, he seemed to enjoy talking about this current musical ventures quite a bit. That brings us to the interview! what's it like to be in the Pastels in 1997? it's really good. we feel really optimistic about what we're doing. i'm really proud of the music that we've been making for the past 3 or 4 years mainly. our new LP `Illumination' comes out in October and we feel very good about it, and there's a really good empathy between Katrina, Aggi, and myself. it's really been a joyful experience for us to play music together. it feels to me like our music is getting better all the time, so we're quite excited. on your new album the melodies take on a less prominent role, and overall the music is now more atmospheric. any special reason forthat? no, that isn't a conscious decision. the way the songs evolve is that we start with the chord patterns. for me, melody is very important. i think a lot of what we do is quite folky. there's a few songs onthe record like `Leaving this Island' and `The Viaduct' that i think are almost like traditional folk songs. we're also pushing in other directions too. we're always trying to take our music someplace new. in what ways do you see this new album is an improvement on `Mobile Safari'? i think it's slightly more 3 dimensional than `Mobile Safari'. `Mobile Safari' is, for us, quite an agressive record. that's what we wanted to do, guitars very close sounding. this time we tried to make the vocals really close, so it sounded like the person's in the room, and we thought it was this kind of 3 dimensionalism, the further into the music you go. for me, it's a better LP that `Mobile Safari'. `Mobile Safari' was us defining the structure of the band, what the band is in the 90s, and with `Illumination' we feel more adventurous. we're not techinically amazing musicians, but we are getting good and we can take more chances. i think the music we're making now is very particular to us and i don't think it really sounds like anyone else. i just really want to continue with that. we read somewhere that `The Pastels are an example of heart-felt emotions being more important than musical abilities.' would you agree? that's a very good overall definition of what the Pastels have been. the music is coming together more now, and we are more musical, but yeah, i think the band is very intense, and there is an emotion around it. for me i always describe it like a good idea badly expressed is always better than a bad idea very well expressed. 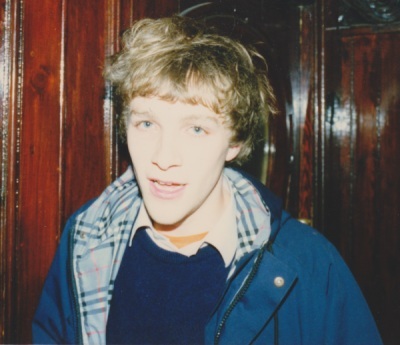 i felt really peculiar about giving away our tapes because we're so precious about them, but i said if Kevin Shields would do a remix the nok, we'll go ahead with this project, thinking that it was a good way of killing the project, because Kevin's quite slow. but then Kevin phoned me and said he would really like to do it. it was almost like a vanity thing because My Bloody Valentine is one of my favorite bands. so you're pleased with the results? yeah, it sounds like the Pastels crossed with My Bloody Valentine and that's a good thing. you've had several guests come help you out on previous albums. anyone special on this new one? i work part time in a book store and we also sell music, and Bill came in to sell his cd, and i put it on and i felt it was amazing, because it captured elements of so much of the jazz that i really like, like Sun Ra and Charles Mingus and Moon Dog [not sure about this on eeither]. i never really hear this kind of music. i think if Bill was in New York he would be highly thought of but he's just coming from the wrong angle. and also Dean Wareham came and played some guitar again. Galaxie 500 is one of my very favorite bands. my dad's a massive jazz fan. he's got a massive collection, and i was always hearing stuff like Duke Ellington when i was around, but of course you don't want to turn into your parents, so i rejected that. i just find sometimes for me, in rock there's maybe about 9 or 10 things that i really really like, and once you've collected all the records by those bands, you kind of want to try something new. how did this tour with Yo La Tengo come about? Yo La Tengo is a band we feel an affinity with, we like their music, we like the warmth of the people involved and their intelligence. We toured in America with them and it went pretty well. Germany's not acountry that we sell many records in, so Domino said why don't you go play there with Yo La Tengo, so we said ok.
you just mentioned that you've never been that successful. Would you ever want to be a mega selling band? absolutely. it's frustrating to be marginal or outsiders. for us, it seems a lot of the decisions we take aren't the most commercially viable decisions, but it's never to try not to sell records, it's always a part of a kind of vision. we never compromise when making records, but we're going to promote this record a lot harder than probably we ever have any record, so i hope that will pay off. do you ever get frustrated when you see bands, especially from Scotland, who have obviously been infulenced by you, but get more favorable reviews in the press? i think you've made a record that pretty much stands on its own and you can't compare it to others. i never care about making the most modern record or anything. i just want to make a record that's gonna sound good now and that's gonna sound good in 10 years, and if it had come out in 1970 it would sound good. how would you compare the current Glasgow scene, with bands like Lung Leg and Bis, with the older scene that you were involved in withbands like The Vaselines or Teenage Fanclub? i think there are some similarities. i think there's a basic folkiness about Glasgow music that you can find in bands like the Delgados and Appendix Out now that was prevalent in the Vaselines or Jesus and Mary Chain. very strong, almost traditional melodies. Bands like Belle and Sebastian and the Delgados are our friends, and we play shows with them. and Teenage Fanclub and the Vaselines are our friends. i think it's a more structured situation now. you know in the 80s it was very ad hoc. i think there was maybe a little less thoughtful. there are better clubs now. things have come a long way. like Lung Leg obviously they probably wouldn't have exactly been around pre-Riot Grrl, so that everyone reflects their situations. So it's kind of different but it's similar if that's not too dumb. do you listen to those new bands much? i esp. like the Delgados. i think they're getting really good now. we were listening to their John Peel session in the van that they just recorded. it sounded really good. and i like Belle and Sebastian. I think overall it's a good scene. there are parts of Ursurei Yatsura i like, there are parts of Lung Leg i like. i can honestly say that i feel pretty enthusiastic overall about the scene. you know i don't listen to those records all the time but most times the Delgados play we'll go see them, and that goes for a lot of the other bands too. do you have any special favorites on this new album or past ones? on the new record i'm really proud of `Cycle' it has a really beautiful vocal backing. the words floored me, they were so poetic. and i like `Frozen Wave' which is the b side of our new single. forme, that's probably the direction we're going in. but i just love asong like `leaving this island' i think it's such a good song. i like`Rough Riders'. on previous records, i like `Mandarin' on `MobileSafari' quite a bit, i like `Thru Your Heart' and `Firebell Ringing'. and of the older stuff, i like the `Comin Through' ep quite a lot. how do you select a live set for tonight? a couple of bits from `Illumination', but mostly from `Mobile Safari'. after being together for such a long time, how satisfied are youwhen you look back? we've got a really good sense of our own worth, but we don't tend to sit around smoking cigars and crack open the champagne and say how great we are. we are always trying to look forward and stay really ambitious, always ready to learn new tricks because i think that's when bands become bad when they no longer learn. what do you expect from the new album? do you think it will be recieved any differently? it's very hard to say. i think there's definitely a shot for it doing really really well. for bands like the Pastels and even Yo LaTengo...i think if there was a new band that would come out with athis record people would be very excited, but a lot of people feel they've defined us and have got a really good handle on what we're about and so maybe there's some respect for us or maybe they like some tunes. i think in a way it's harder almost. well in a way it's easier because you've got your fan base and everything and you've got respect, but also it's harder to make people really...a lot of people aren't good listeners, they think they're hearing the same thing even when it's a new thing. the UK press is very fickle, but i know youjust have to manipulate it and get it to the journalists who'lllisten. there have been a lot of lineup changes over the years. have you ever thought about starting new under a different name? not really...we've got a kind of sensibility about what we do. I mean, a band like Beat Happening who really represents something important in my life, i wouldn't expect them to come out with a new name if they come back with a new record. you've been among the first Creation bands. are you still following the label and do you think the sucess of Oasis has destroyed its reputation? i think it puts out quite conservative music now and i think it seems to puts out a lot of records that are a lot like Oasis, things like 3 Colours Red that to me isn't all that interesting. there are still one or two good things on the label. i think the new Primal Scream record is quite a good record. and obviously i like Teenage Fanclub a lot. it's hard to say nowadays if it's just a trademark for Sony or if it means anything. i think that golden era of creativity like when the Valentines and `Bandwagonesque' and `Screamadelica' came out, it's not really about that now. everything takes second place to the success of Oasis. you can even see when Alan McGee speaks about Primal Scream or Teenage Fanclub it's obvious that there's not the same level of ambition for those bands. in a way he's almost damning them with faint praise just to make things better and better for Oasis. what can we except from the Pastels in the future? we're going to do some more recording later this year. we're gonna play a lot of live shows and keep on doing different things and try not to become too conventional in our approach and retain an aspect of spontenaity. `Illumination' comes out in October. there are a couple songs left over from the LP and we'll probably record a couple more and it'll probably come out in January or something.